Citi PremierMiles Card is a great travel companion. You can rack up miles all year round, plus enjoy a full range of fabulous rewards on your credit card that complement your travel in every aspect. Whether you plan ahead, or take off on a whim, it always makes traveling more worthwhile. From now on, you can enjoy the following hottest offer with your travel credit card. One Card. Elevate your entire journey. Spend locally and overseas and keep earning! Citi PremierMiles Card lets you turn your points into air miles via our preferential mileage program so you can fly to your favorite destinations with a smile on your face. Redeem your round trip tickets for your next trip now! Cardholders who spend HK$72,000 locally are entitled to earn 108,000 Points (HK$1 = 1.5 Points). 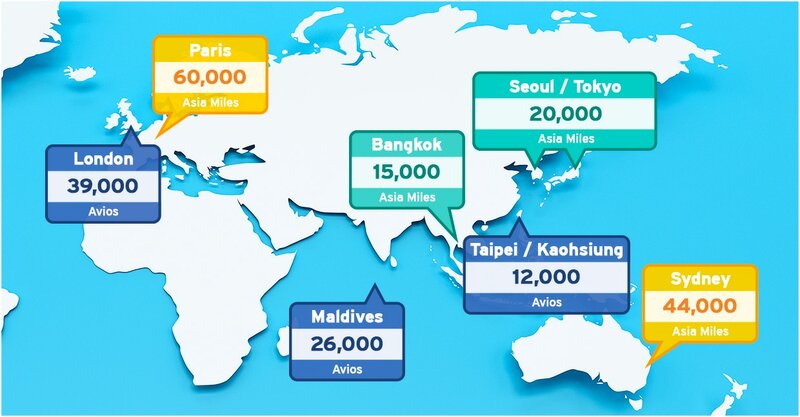 Total Points received can be redeemed to 9,000 Avios which is equivalent to a round trip ticket to Taipei. Accelerate your journey when spending overseas. Redeem miles or hotel stays with Points. Redemption within 5-14 working	days. No handling charge. 12 times complimentary access to more than 50 designated Plaza Premium Lounges worldwide, including Hong Kong, Taiwan, Singapore and London for every calendar year. The Cardholders will be entitled to complimentary access upon spending HK$5,000 per head within 30 days after the date of each lounge visit. Click here for more details of Plaza Premium Lounges locations and services. ^ 39,000 Avios is equivalent to a round trip ticket to London. * For details of the e-wallet, please refer to corresponding service provider(s). The e-wallet information is subject to change of the relevant service provider(s). Citibank reserve the right to amend corresponding Terms and Conditions regarding credit card cash rebate program without prior notice. Citibank shall not be responsible for any matters in relation to any third party services. Pay in full or redeem* for flight tickets/ accommodation/ travel tours with your Citi PremierMiles Card, you and your family can enjoy free travel insurance. Double the Travel Accident Protection by upgrading to Premier Plan. Double your Travel Accident Protection by upgrading to the Premier Plan, and enjoy up to 83% premium discount. Optional benefits are available for purchase upon upgrading to the Premier Plan. Click here for details of the Basic Plan. Refer to the policy details on the Zurich portal for details of the Premier Plan. Please refer to Terms & Conditions of Free Travel Insurance clause 2 for eligibility. Purchases made anywhere in the world with your Citi PremierMiles Card will automatically be insured against any damages, loss or theft for up to US$7,600 within 30 days of purchase. Click here for the factsheet of Purchase Protection Insurance. Citi PremierMiles Card Points allow you to redeem miles or rebates according to your travel plans without having to worry about your mileage expiring. You can enjoy an annual fee waiver privilege by spending HK$100,000 or more with your Citi PremierMiles Card every year before the annual fee renewal month. If the relevant spending requirement is not met, the annual fee will be charged to the card account on your annual fee renewal month without prior notice. Enjoy fast, secure and hassle-free payments with Visa payWave. Simply wave your card in front of a payment terminal that accepts Visa payWave payments present in a wide range of retailers and enjoy the convenience and security of contactless payments. Travel in style with airport limousine pick up service at preferential rates. You can enjoy an array of privileges across the town. ^Applicable on Mondays to Fridays only. *Applicable on Mondays to Fridays on dinner buffet only. Enjoy 5% off selected regular priced Wines, Spirits, Sake and Fruit Liqueur. Valid until December 31, 2019. Please click here for more offers and terms and conditions. Applying online for a Citi PremierMiles Card is easy. Fill-in the online application form. Please send copies of your supporting document here. Unless otherwise specified, the offers apply to principal and supplementary cardholders ("Cardholders") of Citi® PremierMiles Card ("Card") issued by Citibank (Hong Kong) Limited ("Citibank"). The offers cannot be used in conjunction with other special promotions, discounts or promotional coupons, nor be transferred or exchanged for cash or other offers. Availability of the offers is subject to offer or service availability, account status checking and final acceptance by Citibank and the respective merchants' absolute discretion. Photos, product specifications and prices are for reference only. Citibank shall not be responsible for any matters in relation to the related products or services. The respective merchants are solely responsible for all obligations and liabilities relating to such products or services and all auxiliary services. Citibank and the respective merchants reserve the right to amend the Terms & Conditions without prior notice. All matters and disputes are subject to the final decision of Citibank and the respective merchants. Cardholders of Citi PremierMiles Card will be awarded 12 Points (1 mile) per HK$8 local transaction posted. Extra Rewards will be awarded when Citi PremierMiles Cardholder reaches total Eligible Transactions (including both local and overseas transactions) of HK$20,000 or above in one statement cycle, he/she will be awarded 12 Points (1 mile) per HK$3 (or equivalent foreign currency) overseas and online foreign currency transactions posted. If the total Eligible Transactions are below HK$20,000, Cardholders can still enjoy 12 Points (1mile) per HK$4 (or equivalent foreign currency) for all eligible overseas and online foreign currency transactions. "Eligible Transactions" exclude, but are not limited to, cash advances, fees and charges, withdrawal amount under the Balance Transfer Program, Cash Conversion Program and Citi Credit Card "Quick Cash" Installment Program, payment to the Inland Revenue Department, casino transactions, online bill payment, transactions through Faster Payment System (FPS) Service or unposted /canceled /refunded transactions. Overseas and online foreign currency transactions are defined as transactions settled in currencies except Hong Kong dollar, Renminbi or Macau Patacas (including internet transactions). Citibank reserves the right to change at any time and without prior notice the ratio between Point(s) to be awarded; and the specified amount charged to the Eligible Card account. Unless otherwise specified, all Points earned by the principal and supplementary Cardholders of the same Eligible Card will be accumulated under the principal Cardholder's account. Unless otherwise specified, only principal Cardholders are eligible for Points Redemption. Invalid transactions not eligible for Points include, but are not limited to, cash advances, fees and charges, withdrawal amount under the Balance Transfer Program, Cash Conversion Program and Citi Credit Card "Quick Cash" Installment Program, payment to the Inland Revenue Department, casino transactions, online bill payment, dynamic currency conversion transactions, or unposted /canceled /refunded transactions. Citibank may add to, or remove from, the list of invalid transactions as stated in Clause 6 above from time to time at its discretion. The decision of Citibank as to what constitutes an invalid transaction shall be final and conclusive. Points earned on Citi PremierMiles Card are evergreen. Should any transaction in the monthly statement be canceled or refunded for whatever reason, the Points earned in respect to those transactions will be deducted or canceled. Cardholders can convert his/her Points to miles/hotel points of Asia Miles, British Airways Executive Club, Etihad Guest, EVA Air Infinity MileageLands, Flying Blue, Garuda Indonesia Frequent Flyer, IHG Rewards Club, Malaysia Airlines Enrich, Qantas Frequent Flyer, Qatar Airways Privilege Club, Singapore Airlines KrisFlyer, Thai Airways Royal Orchid Plus or Virgin Atlantic Flying Club (each a "Mileage/Hotel Program") for free by visiting Citi ThankYou Rewards (citibank.com.hk/thankyou). Every 12 Points can be converted to 1 mile/hotel point of the Mileage/Hotel Program. Cardholders must convert a minimum of 1,500 Miles/Hotel Points for Asia Miles, British Airways Executive Club, Etihad Guest, EVA Air Infinity MileageLands, Flying Blue, Garuda Indonesia Frequent Flyer, IHG Rewards Club, Malaysia Airlines Enrich, Qantas Frequent Flyer, Qatar Airways Privilege Club, Singapore Airlines KrisFlyer, Thai Airways Royal Orchid Plus and Virgin Atlantic Flying Club. Principal Cardholders must be a member of the frequent flyers program and the hotel privilege programs and be able to provide a valid membership number of his /her own Mileage Program account when converting Points to miles. Citibank will not accept any liability in relation to any loss incurred due to incorrect information provided by the principal Cardholders. Once the request for redemption is confirmed by Citibank, mileage conversion will be completed in 5 business days for Asia Miles, British Airways Executive Club, EVA Air Infinity MileageLands, Flying Blue, Garuda Indonesia Frequent Flyer, IHG Rewards Club, Malaysia Airlines Enrich, Qantas Frequent Flyer, Qatar Airways Privilege Club, Singapore Airlines KrisFlyer or Virgin Atlantic Flying Club and 14 business days for Etihad Guest or Thai Airways Royal Orchid Plus. The program rules of each Mileage Program is subject to change including regulations, policies, benefits, conditions of participation or mileage levels, in whole or in part at any time with or without notice and Citibank does not accept any responsibility in relation thereto. a) Conventional mileage programs refer to other credit cards rewards programs converting points to miles. The mileage conversion rate used by conventional mileage programs is assumed to be HK$6 = 1 mile for Eligible Transactions in the local currency. b) The calculation of spending required to redeem for round trip tickets is based on the below table. Reward flight redemption with Avios or miles are subject to availability. Taxes, fees and carrier charges apply. The mileage information is as of July 10, 2018 and is subject to changes in the respective mileage programs. The principal and supplementary cardholders ("Cardholders") of the Citi PremierMiles Card can each enjoy 12 complimentary visits to selected Plaza Premium Lounges in a calendar year, provided that Cardholders make local / overseas spending of HK$5,000 per lounge access within 30 days after the date of the lounge access ("Spending Requirement"). The spending of Cardholders will be counted collectively for calculating the complimentary lounge access. For example, if the principal and supplementary cardholders enter the lounge together, the Cardholders are required to collectively meet a total spending of at least HK$10,000 (inclusive of local / overseas eligible spending) within 30 days after the lounge access. If the Cardholders cannot meet the Spending Requirement, they will be charged an entrance fee of HK$200 per cardholder per lounge access. The entrance fee shall be debited from the Cardholder's Card directly within 3 months from the access date. If a Cardholder exceeds the 12 complimentary visits to selected Plaza Premium Lounges per calendar year, the Cardholders shall pay an entrance fee of HK$200 for each additional access. The entrance fee shall be debited from the Cardholder's Card account directly within 3 months from the access date. Each accompanying guest shall pay an entrance fee of HK$200 for each access, which will be debited from the Cardholder's Card directly within 3 months from the access date. All posted transactions conducted by principal and supplementary card(s) are included in the Spending Requirement calculation. Invalid transactions, including but not limited to, withdrawal amount under the Balance Transfer Program, Cash Conversion Program and Citi Credit Card "Quick Cash" Installment Program, cash advances, fees and charges, payment to the Inland Revenue Department, casino transactions, online bill payment, transactions through Faster Payment System (FPS) Service or unposted / cancelled / refunded transactions are excluded. Free Travel Insurance is valid for travel journey between April 1, 2019 and March 31, 2020 (both dates inclusive). To be eligible for free travel insurance, (a) either one or more of the following has/have been purchased or settled by the principal cardholder with his/her Citi PremierMiles Card: (1) the in/outward-bound travel tickets to/from Hong Kong; (2) the accommodation cost for the entire journey; (3) the tour package; or (b) in the event that condition (a) above is not satisfied but instead one or more of the items stated in (1), (2) and (3) above has been acquired with points earned by a rewards program, any additional costs (including tax and fuel surcharge and any fees which is required to be paid according to any local requirement (if applicable)) must be paid by the principal cardholder with his/her Citi PremierMiles Card. Principal Cardholder will be entitled for Free Travel Insurance Basic Plan, and could upgrade to Premier Plan for improved coverage. Principal Cardholders could upgrade through Zurich's portal or call Zurich's Customer Service hotline at 2903 9482. Please refer to the policy wordings in Zurich's portal for detailed coverage. Only upon upgrading to the Premier Plan, could the Principal Cardholders purchase the Optional Benefits. When submitting claims, Zurich Insurance Company Limited will require Principal Cardholders to provide valid proof of their eligibility. Citibank (Hong Kong) Limited is not the insurance underwriter of the Travel Insurance Basic Plan and Travel Insurance Premier Plan ("the Policy"). Zurich Insurance Company Ltd.is the insurance underwriter ("the Insurance Underwriter") of the Policy above and is solely responsible for all coverage and compensation. The Insurance Underwriter is not asubsidiary or an affiliate of Citibank (Hong Kong) Limited or Citibank, N.A. or Citigroup Inc. The Policy is part of the credit card feature and Citibank (Hong Kong) Limited shall not be responsible for any matters in relation to the Policy provided. Unless otherwise specified, insurance products are not bank deposits or obligations of, guaranteed or insuredby Citibank (Hong Kong) Limited, Citibank, N.A., Citigroup Inc. or any of their affiliates or subsidiaries, or by any local government agency. This statement is not a policy or contract of insurance. The original policy is on file at the office of Citibank (Hong Kong) Limited. Final decisions will be made in accordance with original policy. For insurance details, please refer to the Factsheet of Travel Insurance Basic Plan or Travel Insurance Premier Plan. For claims enquiry, please call Zurich's Customer Services Hotline at 2903 9482. Citibank (Hong Kong) Limited and its Insurance Underwriter reserve the right to make the final decision on all claims. The period of insurance is available from April 1, 2019 to March 31, 2020 (both dates inclusive). Principal Cardholders are required to settle payments with their Card in order to enjoy the offers. The offer starts upon Principal Cardholders charging their purchase to the Card for a period of 30 days. For item purchased under a merchandising program, coverage of 30 days shall commence from the date of delivery of merchandise in undamaged condition to the Principal Cardholder. Citibank (Hong Kong) Limited is not the insurance underwriter of the Purchase Protection Insurance ("the Policy"). Zurich Insurance Company Ltd. is the insurance underwriter ("the Insurance Underwriter") of the Policy above and is solely responsible for all coverage and compensation. The Insurance Underwriter is not a subsidiary or an affiliate of Citibank (Hong Kong) Limited or Citibank, N.A. or Citigroup Inc. The Policy is part of the credit card feature and Citibank (Hong Kong) Limited shall not be responsible for any matters in relation to the Policy provided. Unless otherwise specified, insurance products are not bank deposits or obligations of, guaranteed or insured by Citibank (Hong Kong) Limited, Citibank, N.A., Citigroup Inc. or any of their affiliates or subsidiaries, or by any local government agency. This statement is not a policy or contract of insurance. The original policy is on file at the office of Citibank (Hong Kong) Limited. Final decisions will be made in accordance with original policy. For insurance details, please refer to the Purchase Protection Insurance Factsheet. For claims enquiry, please call Zurich's Customer Services Hotline at 2903 9482. Citibank (Hong Kong) Limited and its Insurance Underwriter reserve the right to make the final decision on all claims. Unless otherwise specified, the promotion period is valid from January 1 to December 31, 2019 (both dates inclusive). The offer is not applicable on January 1, February 4-7, 14, April 4-5, 19-22, 30, May 1, 12-13, June 6-7, 16, 30, July 1, September 9-14, 30, October 1, 6-7, December 22, 24-26, 31, all public holidays, their eves, firework nights in 2019. Unless otherwise specified, the promotion applies to Cardholders of Citi PremierMiles Card ("Eligible Card")issued by Citibank (Hong Kong) Limited ("Citibank"). Offer is applicable for 2 to 12 persons per table only. Cardholders are required to state their intention to enjoy the offers at the time of reservation and before ordering and settle the whole payment by Citi PremierMiles Card to enjoy the dining offers. Offer is not applicable to private events. Card usage is strictly limited to one card per group/table. Any big group requesting to be seated at separate tables will be treated as one table to enjoy the offer. Unless otherwise specified, 10% service charge and tea & condiments (if applicable) apply to the dining offers, and will be counted in original price. Unless otherwise specified, the offers cannot be used in conjunction with other special promotions, discounts or promotional coupons, nor be transferred or exchanged for cash or other offers. Unless otherwise specified, the dining offers are not applicable to public holidays/festive days and their eves, banqueting, wedding banquets, VIP rooms, discounted set meal, special promotional item, cigarettes/cigars, beverages, bottled liquor/wine, tickets/coupons/vouchers, valet parking privileges, delivery service, takeaway, or dates designated by the merchants, and are applicable to dine-in only. Availability of the offers is subject to offer or service availability, account status checking and final acceptance by Citibank and the respective merchants' absolute discretion. Photos, product specifications and prices are for reference only. Advance reservation is required and Members must be one of the patrons. Citibank shall not be responsible for any matters in relation to the related products or services. The respective merchants are solely responsible for all obligations and liabilities relating to such products or services and all auxiliary services. Citibank and the respective merchants reserve the right to amend the Terms and Conditions without prior notice. In the event of any discrepancy between the English and Chinese versions of these Terms and Conditions, the English version shall prevail. Other Terms and Conditions apply, please inquire the details with the merchants. Offer is valid from January 1, 2019 until December 31, 2019 (both days inclusive) (“Promotion Period”). The offers apply to principal and supplementary cardholders ("Cardholders") of Citi PremierMiles Card ("Eligible Card") issued by Citibank (Hong Kong) Limited ("Citibank"). Cardholders of the Eligible Card can enjoy 5% discount on selected regular priced wine, spirit, sake and fruit liqueur items only. For selected items, please inquire about the details with the shop staff. Offer is not applicable to selected items and limited editions including but not limited to Domaine de la Romanée-Conti, KARUIZAWA, Hanyu, Macallan Old Label, Juyondai, Kokuryu Limited Edition and Isojiman Limited Edition. Offer is not applicable to online purchase and delivery charges. The offers cannot be used in conjunction with others discounts, VIP cards, gift cards, coupons or other promotional offers, nor be transferred or exchanged for cash, other products or offers. To enjoy the offer, payment must be settled in full by Eligible Card by Members. Prices listed may be subject to service charge and prevailing government taxes where applicable. Citibank shall not be responsible for any matters in relation to the related products or services. The Merchant is solely responsible for all obligations and liabilities relating to such products or services. Citibank and Liquid Gold reserve the right to suspend, revise or terminate the above offers and amend the terms and conditions thereof at any time without prior notice. All matters and disputes are subject to the final decision of Citibank and the Merchant.